MEASURE THE LENGTH AND GIRTH OF YOUR FISH. ESTIMATE THE WEIGHT. The built-in automatic weight estimator was based on the original OFAH weight calculator. This is an extremely handy feature that allows you to enter the length and girth measurements at the time you take a photo. 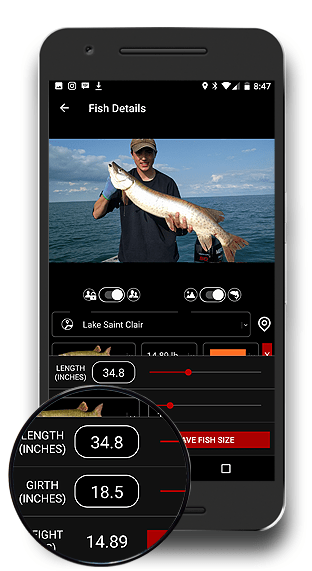 This provides fishermen a math-based option for estimating fish weight versus guessing. Planning a fishing tournament that involves catch-and-release? FISHBUOY Weight Estimator is a great option when running events that require fish to be quickly returned to the water. Musky for example are too sensitive to transport to weigh-in stations. This Weight Estsimator is a means to have all fishing participants use a single and consistent tool to measure fish. Why not estimate fish weight using proven methods? Though most fishermen estimate fish weight within 1-2 pounds accuracy (wink wink), sometimes a more accurate approach is needed when comparing notes with fishing buddies. Bragging rights? Why not compare using a consistent method?